2010 Indian Premier League - IPL3 Deccan Chargers beat Royal Challengers Bangalore 46th Matches win 13 runs, Monday, 12th April, 2010, at Nagpur. DC 151/6 in 20 overs while RCB made 138/all out in 19.4 overs. man of the Match is Rohit Sharma who made 51 runs. 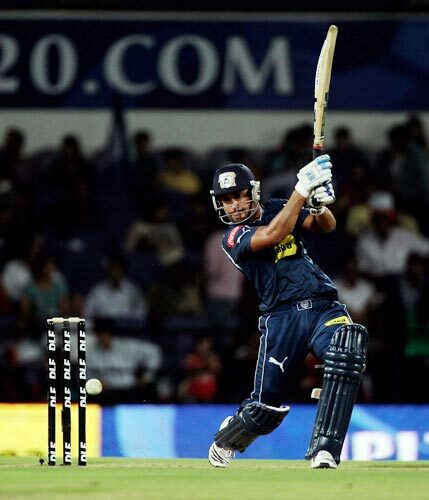 Deccan Chargers survived three huge blows in the first two overs of the match, and some more towards the end by Robin Uthappa, to keep alive their hopes of a semi-final berth. In a match that lurched wildly one way and then another, Harmeet Singh delivered the most decisive blow as Deccan held their nerve and eked out a 13-run win to move up to fifth in the points table. Royal Challengers Bangalore had nailed the decisive advantage. First, when Dale Steyn took three wickets in first two overs, including those of Adam Gilchrist and Hershelle Gibbs, to reduce Deccan to 14 for 3; then, when Rahul Dravid creamed a classy and effortless 35-ball 49 to put Bangalore right on track in their run-chase; and again, when Uthappa struck two towering sixes off Ryan Harris in the 17th over to reduce the target to 18 from 12 balls. Result - Deccan Chargers won by 13 runs.